Time for toys and time for cheer! 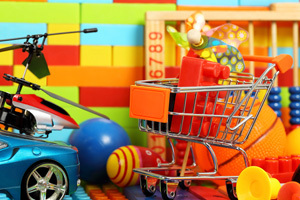 Shopping for toys this holiday season should be a fun activity, not one burdened by purchasing unintended safety risks. Below are a few holiday shopping tips to make sure your gift is safe for every boy and girl. Before starting your holiday shopping, take inventory of the child’s age, ability level and interests. This will help you immensely when considering toy safety. Most toys have age recommendations printed on the packaging that will allow you to easily gauge whether the product is appropriate for the child for whom you are shopping. However, it should be noted that these are guidelines, and knowing the ability level of the child, and the manner in which he/she tends to play with his/her toys, is arguably more important than his/her age. If you are purchasing athletic gear, such as a bicycle, be sure to select the right size for the child. This includes any safety gear like helmets, and elbow and knee pads. According to the Consumer Product Safety Commission, the “leading causes of toy-related fatalities include choking and aspiration of toy parts.” Bear this in mind when you are selecting toys. If the toy looks like it could easily be broken, or contains small parts, it might not be the best choice. If the toy features small balls, up to and including those 3 inches in diameter, it could pose a danger to a small child. Avoid buying toys that contain high-powered magnets or button batteries, as these can be extremely dangerous if swallowed. Avoid purchasing toys that require cords or strings, as these could cause strangulation. Finally, avoid toys that are or could be used as projectiles. When prioritizing toy safety, read all warning labels on the product’s packaging. In addition, follow all instructions for use and assembly carefully. If you are assembling a toy, test the finished toy to ensure durability before giving it to the child. Also be sure to dispose of any small plastic bags used to contain parts or plastic fasteners used in the packaging. Finally, if you are purchasing a used toy for a child, be sure to check if the model has been recalled by visiting the CPSC’s website. If you or a loved one has suffered an injury due to product liability, our team is here to help. Contact one of our skilled attorneys 24/7 to get the Results You Deserve®.